I had been avoiding signing the petition asking Mayor Fontana to take a leave. In my mind, it quite easily could have been a big mix-up, and I didn’t want to get carried away and push for something on the basis of misinformation. However, now that charges have been laid, I have changed my stance. It’s not that I think we should call him guilty before trial and force a resignation, and it’s not that I even support the hyperbole around the ‘moral authority to lead’. Rather, I cringe at the thought of him serving as our chief ambassador until these charges have been settled. I note in his review of Year 2 that the Mayor has attended 300+ community events, as well as attending regional, national, and international functions. I believe that until this whole scenario is cleared up, councillors would serve as much better ambassadors for our City, in his place. I know that this has been a difficult situation for you and your colleagues, and hope that you can find a way to optimize the image of our City in the face of negative national press. In a follow-up to my last post about the importance of relationships, I wanted to speak to public participation and the things that citizens say. Because let’s be honest, I’ve often shaken my head at the things that people say in public participation or electronic submissions, even if I support their general premise. a. Following the abatement system retrofit in October 2010 and up to the end of July 2012, 71% of the complaints that Orgaworld has received are coming from the same six households. b. One of the above six households called in multiple odour complaints when the plant was not in operation. c. We have received complaints when the wind was consistently blowing in the opposite direction. attributed to Orgaworld were in fact due to the City Landfill. e. We have received complaints from individuals as far as 20 km away. 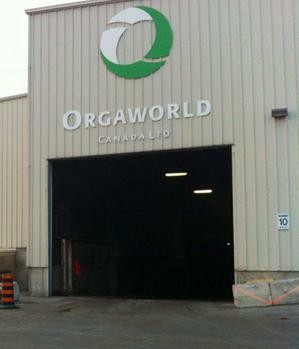 f. People claim they have been smelling the Orgaworld plant for the past 27 years (please note we have only been in operation for 5 years). official classified it as being a “2” and a light intermittent odour. Let’s be honest, complaints about odour are legitimate, but there is nothing to be gained from piling on. In fact, you can quickly lose your credibility with a bit of hyperbole or irrationality. We saw this in the methadone clinic public meetings, where interesting concerns like crossing the road from a bus stop were over-shadowed by “Won’t anyone think of the children!” I saw this the other night at planning when concerns about demolition in a heritage district turned into personal attacks and yelling. You see this when citizens both complain about sprawl and about building up (cf. BANANA – Build Absolutley Nothing Anywhere Near Anything). If you want to have a voice that’s heard, you’re going to have to keep it together. This past Monday I had the privilege of spending the afternoon and evening with Councillor Sandy White. I won the opportunity by completing a survey on the City of London website during Local Government Week. Sandy and I spent some time chatting in her office, then much of the day was spent sitting with her at the Planning and Environment Committee meeting. One of the things that was particularly interesting from the experience was seeing the many interactions that councillors have with constituents. One of the things that this solidified to me was the importance to building positive relationships. It was clear from my six hours at City Hall that although London is large, the doors of the Hall are quite wide open (and councillor office doors are literally so). 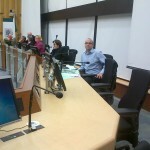 Councillors, staff, applicants, media, and constituents mingle freely in offices, cafeterias, hallways, and Council Chambers. Although procedure gives things the appearance of being bureaucratic, everything is much more open than you might think. To me, this is a good thing. Knowing a councillor checks all of his or her emails, phone calls, facebook messages, and happily stops and chats with whomever wants to, is very encouraging. 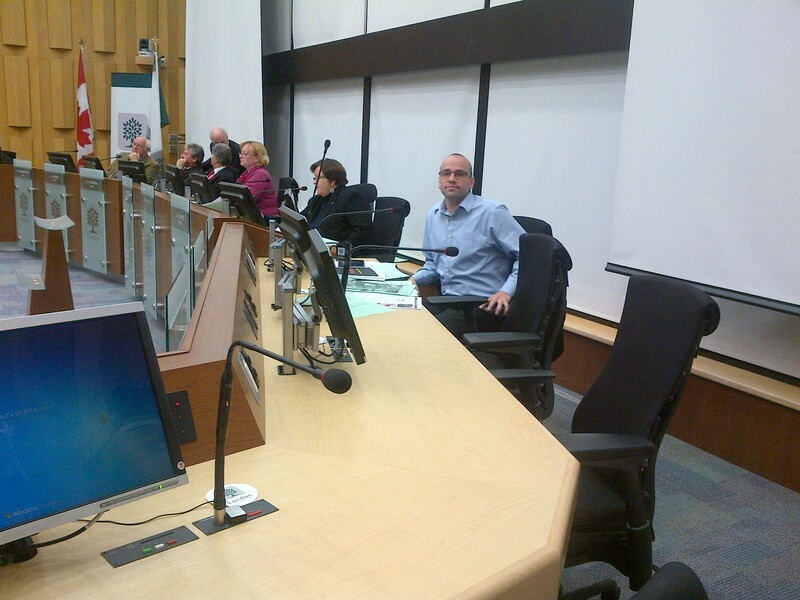 Because councillors are open, personable, and as politicians are often relationally-focused, how you interact with them matters. Email out-bursts, social media spamming, or public attacks are not likely to be easily forgotten. Similarly, in the context of planning, how the applicant relates to the City matters. Being insulting, condescending, or pushy can make it harder for Council in situations that require give-and-take on both sides. The same goes of community members and organizations. Respectful letters and well thought out verbal statements are much more meaningful than emotional tirades. And the same goes with staff. It was clear that staff spoke to how applicants were working with them on a issue, and this impacted their interest in expediting processes. This is not to say that processes are unfair, or that friends receive special treatment. Rather, it’s to say that in working with the City, staff or councillors, there is nothing gained from being rude, but much to lose. And this doesn’t go for just politics, I believe this is an important principle for life in general. Your ability to have influence so often comes down to your ability to foster positive relationships. In the article “Downtown Too Rough For Business?” I was surprised to see the term ‘vagrants’ being used to describe people experiencing poverty or homelessness. It made me want to break out my gramophone and dance a jive with a west-end filly. In all seriousness though, terms like ‘vagrants’ and ‘bums’ have been dropped from our lexicon years ago because they lack the respect we like to show people regardless of their lessened circumstances. That ‘vagrant’ on the corner? That’s Mike, who lost his job, suffers from bi-polar disorder, and is waiting on the affordable housing list. That ‘vagrant’ shuffling along the sidewalk? That’s Jessica, who ran away from her abusive home and is now going to Wheable to complete her high school education. Call me a curmudgeon, but given a series of unfortunate events, that person experiencing absolute poverty could even be you and I.